The Lindo LDG-7X is the latest seven string offering from Lindo guitars. If you are into your heavy low end riffing then the seven string guitar is a must have instrument and the Lindo LDG-7X offers much for a mid priced instrument. Lindo are a UK based guitar outfit probably best known for their Dark Defender guitar which is much loved by our readers. They added a seven string budget model to their range, the Lindo LDG-7, and this has apparently been a successful addition to the Lindo stable. However, with the Lindo LDG-7X the company have departed from the budget guitar market and moved up the price scale. In doing so it looks as if they have produced a guitar that will only further the reputation of Lindo as a quality guitar manufacturer. The Lindo LDG-7X is a super strat style seven string guitar. The body is made from Tilia, better known as Basswood, which is a light and cost effective tonewood. Although not too thick the body has sufficient wood to create good resonance but is still light making it a comfortable guitar to play. The body is topped off with a great looking maple veneer. The neck is made from maple and has a satin finish, which I like as the hand will glide quickly across the surface of the neck. 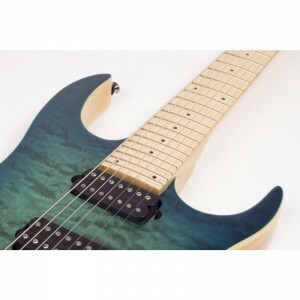 The body is nicely contoured giving easy access to the upper frets and the neck itself, with the added seventh string, does not feel too wide that it is uncomfortable. All in all this is a great neck to play. The finish of the guitar is great with the maple top showing through the clear blue gloss paint job. The two tone finish is nicely done too, although it might not appeal to everyone. The Lindo LDG-7X has a 24 fret maple neck and two CNC wound matched humbuckers. The Lindo LDG-7X features a string through body bridge which is an improvement on the LDG-7 which had a Floyd Rose style tremolo, the tuning is therefore very stable. In terms of pick-ups the LDG-7X is fitted with CNC wound matched humbuckers which are accessed through a three way selector switch. Finally the LDG-7X has master tone and volume controls so there is plenty of scope to experiment with the tonal output of the guitar. The overall build quality of the guitar is good. But for a guitar of this price it is perhaps a surprise that the components are not of a slightly higher spec. However, in reality this does not detract from the playing experience which is good. Plugged in the guitar sounds great with plenty of low end crunch to satisfy even the heaviest of riffers. Check out the video below to see the Lindo LDG-7X in action. The Lindo LDG-7X is not a cheap guitar, but it is not too expensive either. The build quality of the guitar is good and the sound quality is great too. 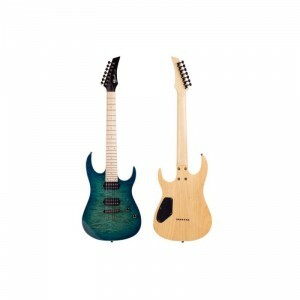 Essentially if you are looking for a seven string which is going to become a faithful friend then you could do a lot worse than taking a look at the Lindo LDG-7X. Currently you can buy the Lindo LDG-7X through Amazon for a penny under £500. Buy the Lindo LDG-7X through Amazon.